This article is about the legal right. For the symbol, see Copyright symbol. For the Wikipedia policy about copyright issues, see Wikipedia:Copyrights. Not to be confused with Copywriting. Copyright is applicable to certain forms of creative work. Some, but not all jurisdictions require "fixing" copyrighted works in a tangible form. It is often shared among multiple authors, each of whom holds a set of rights to use or license the work, and who are commonly referred to as rights holders. These rights frequently include reproduction, control over derivative works, distribution, public performance, and moral rights such as attribution. Copyrights can be granted by public law and are in that case considered "territorial rights". This means that copyrights granted by the law of a certain state, do not extend beyond the territory of that specific jurisdiction. Copyrights of this type vary by country; many countries, and sometimes a large group of countries, have made agreements with other countries on procedures applicable when works "cross" national borders or national rights are inconsistent. Typically, the public law duration of a copyright expires 50 to 100 years after the creator dies, depending on the jurisdiction. Some countries require certain copyright formalities to establishing copyright, others recognize copyright in any completed work, without formal registration. Generally, copyright is enforced as a civil matter, though some jurisdictions do apply criminal sanctions. Copyright came about with the invention of the printing press and with wider literacy. As a legal concept, its origins in Britain were from a reaction to printers' monopolies at the beginning of the 18th century. The English Parliament was concerned about the unregulated copying of books and passed the Licensing of the Press Act 1662, which established a register of licensed books and required a copy to be deposited with the Stationers' Company, essentially continuing the licensing of material that had long been in effect. Copyright laws allow products of creative human activities, such as literary and artistic production, to be preferentially exploited and thus incentivized. Different cultural attitudes, social organizations, economic models and legal frameworks are seen to account for why copyright emerged in Europe and not, for example, in Asia. In the Middle Ages in Europe, there was generally a lack of any concept of literary property due to the general relations of production, the specific organization of literary production and the role of culture in society. The latter refers to the tendency of oral societies, such as that of Europe in the medieval period, to view knowledge as the product and expression of the collective, rather than to see it as individual property. However, with copyright laws, intellectual production comes to be seen as a product of an individual, with attendant rights. The most significant point is that patent and copyright laws support the expansion of the range of creative human activities that can be commodified. This parallels the ways in which capitalism led to the commodification of many aspects of social life that earlier had no monetary or economic value per se. Copyright has grown from a legal concept regulating copying rights in the publishing of books and maps to one with a significant effect on nearly every modern industry, covering such items as sound recordings, films, photographs, software, and architectural works. 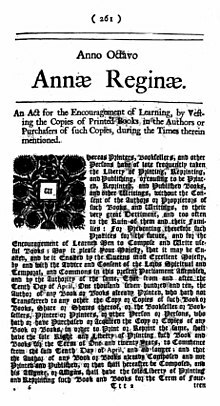 Often seen as the first real copyright law, the 1709 British Statute of Anne gave the publishers rights for a fixed period, after which the copyright expired. The act also alluded to individual rights of the artist. It began, "Whereas Printers, Booksellers, and other Persons, have of late frequently taken the Liberty of Printing ... Books, and other Writings, without the Consent of the Authors ... to their very great Detriment, and too often to the Ruin of them and their Families:". A right to benefit financially from the work is articulated, and court rulings and legislation have recognized a right to control the work, such as ensuring that the integrity of it is preserved. An irrevocable right to be recognized as the work's creator appears in some countries' copyright laws. The Copyright Clause of the United States, Constitution (1787) authorized copyright legislation: "To promote the Progress of Science and useful Arts, by securing for limited Times to Authors and Inventors the exclusive Right to their respective Writings and Discoveries." That is, by guaranteeing them a period of time in which they alone could profit from their works, they would be enabled and encouraged to invest the time required to create them, and this would be good for society as a whole. A right to profit from the work has been the philosophical underpinning for much legislation extending the duration of copyright, to the life of the creator and beyond, to their heirs. The original length of copyright in the United States was 14 years, and it had to be explicitly applied for. If the author wished, they could apply for a second 14‑year monopoly grant, but after that the work entered the public domain, so it could be used and built upon by others. Copyright law was enacted rather late in German states, and the historian Eckhard Höffner argues that the absence of copyright laws in the early 19th century encouraged publishing, was profitable for authors, led to a proliferation of books, enhanced knowledge, and was ultimately an important factor in the ascendency of Germany as a power during that century. 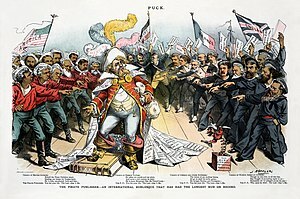 The 1886 Berne Convention first established recognition of copyrights among sovereign nations, rather than merely bilaterally. Under the Berne Convention, copyrights for creative works do not have to be asserted or declared, as they are automatically in force at creation: an author need not "register" or "apply for" a copyright in countries adhering to the Berne Convention. As soon as a work is "fixed", that is, written or recorded on some physical medium, its author is automatically entitled to all copyrights in the work, and to any derivative works unless and until the author explicitly disclaims them, or until the copyright expires. The Berne Convention also resulted in foreign authors being treated equivalently to domestic authors, in any country signed onto the Convention. The UK signed the Berne Convention in 1887 but did not implement large parts of it until 100 years later with the passage of the Copyright, Designs and Patents Act 1988. Specially, for educational and scientific research purposes, the Berne Convention provides the developing countries issue compulsory licenses for the translation or reproduction of copyrighted works within the limits prescribed by the Convention. This was a special provision that had been added at the time of 1971 revision of the Convention, because of the strong demands of the developing countries. The United States did not sign the Berne Convention until 1989. The United States and most Latin American countries instead entered into the Buenos Aires Convention in 1910, which required a copyright notice on the work (such as all rights reserved), and permitted signatory nations to limit the duration of copyrights to shorter and renewable terms. The Universal Copyright Convention was drafted in 1952 as another less demanding alternative to the Berne Convention, and ratified by nations such as the Soviet Union and developing nations. The regulations of the Berne Convention are incorporated into the World Trade Organization's TRIPS agreement (1995), thus giving the Berne Convention effectively near-global application. In 1961, the United International Bureaux for the Protection of Intellectual Property signed the Rome Convention for the Protection of Performers, Producers of Phonograms and Broadcasting Organizations. In 1996, this organization was succeeded by the founding of the World Intellectual Property Organization, which launched the 1996 WIPO Performances and Phonograms Treaty and the 2002 WIPO Copyright Treaty, which enacted greater restrictions on the use of technology to copy works in the nations that ratified it. The Trans-Pacific Partnership includes intellectual Property Provisions relating to copyright. Copyright laws are standardized somewhat through these international conventions such as the Berne Convention and Universal Copyright Convention. These multilateral treaties have been ratified by nearly all countries, and international organizations such as the European Union or World Trade Organization require their member states to comply with them. The original holder of the copyright may be the employer of the author rather than the author himself if the work is a "work for hire". For example, in English law the Copyright, Designs and Patents Act 1988 provides that if a copyrighted work is made by an employee in the course of that employment, the copyright is automatically owned by the employer which would be a "Work for Hire". Typically, the first owner of a copyright is the person who created the work i.e. the author. But when more than one person creates the work, then a case of joint authorship can be made provided some criteria are met. Copyright may apply to a wide range of creative, intellectual, or artistic forms, or "works". Specifics vary by jurisdiction, but these can include poems, theses, fictional characters plays and other literary works, motion pictures, choreography, musical compositions, sound recordings, paintings, drawings, sculptures, photographs, computer software, radio and television broadcasts, and industrial designs. Graphic designs and industrial designs may have separate or overlapping laws applied to them in some jurisdictions. Copyright does not cover ideas and information themselves, only the form or manner in which they are expressed. For example, the copyright to a Mickey Mouse cartoon restricts others from making copies of the cartoon or creating derivative works based on Disney's particular anthropomorphic mouse, but does not prohibit the creation of other works about anthropomorphic mice in general, so long as they are different enough to not be judged copies of Disney's. Note additionally that Mickey Mouse is not copyrighted because characters cannot be copyrighted; rather, Steamboat Willie is copyrighted and Mickey Mouse, as a character in that copyrighted work, is afforded protection. Typically, a work must meet minimal standards of originality in order to qualify for copyright, and the copyright expires after a set period of time (some jurisdictions may allow this to be extended). Different countries impose different tests, although generally the requirements are low; in the United Kingdom there has to be some "skill, labour, and judgment" that has gone into it. In Australia and the United Kingdom it has been held that a single word is insufficient to comprise a copyright work. However, single words or a short string of words can sometimes be registered as a trademark instead. Copyright law recognizes the right of an author based on whether the work actually is an original creation, rather than based on whether it is unique; two authors may own copyright on two substantially identical works, if it is determined that the duplication was coincidental, and neither was copied from the other. A widely circulated strategy to avoid the cost of copyright registration is referred to as the poor man's copyright. It proposes that the creator send the work to himself in a sealed envelope by registered mail, using the postmark to establish the date. This technique has not been recognized in any published opinions of the United States courts. 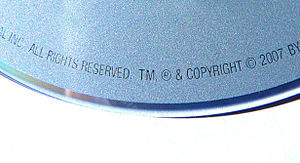 The United States Copyright Office says the technique is not a substitute for actual registration. The United Kingdom Intellectual Property Office discusses the technique and notes that the technique (as well as commercial registries) does not constitute dispositive proof that the work is original or establish who created the work. The Berne Convention allows member countries to decide whether creative works must be "fixed" to enjoy copyright. Article 2, Section 2 of the Berne Convention states: "It shall be a matter for legislation in the countries of the Union to prescribe that works in general or any specified categories of works shall not be protected unless they have been fixed in some material form." Some countries do not require that a work be produced in a particular form to obtain copyright protection. For instance, Spain, France, and Australia do not require fixation for copyright protection. The United States and Canada, on the other hand, require that most works must be "fixed in a tangible medium of expression" to obtain copyright protection. U.S. law requires that the fixation be stable and permanent enough to be "perceived, reproduced or communicated for a period of more than transitory duration." Similarly, Canadian courts consider fixation to require that the work be "expressed to some extent at least in some material form, capable of identification and having a more or less permanent endurance." Before 1989, United States law required the use of a copyright notice, consisting of the copyright symbol (©, the letter C inside a circle), the abbreviation "Copr. ", or the word "Copyright", followed by the year of the first publication of the work and the name of the copyright holder. Several years may be noted if the work has gone through substantial revisions. The proper copyright notice for sound recordings of musical or other audio works is a sound recording copyright symbol (℗, the letter P inside a circle), which indicates a sound recording copyright, with the letter P indicating a "phonorecord". In addition, the phrase All rights reserved was once required to assert copyright, but that phrase is now legally obsolete. Almost everything on the Internet has some sort of copyright attached to it. Whether these things are watermarked, signed, or have any other sort of indication of the copyright is a different story however. In 1989 the United States enacted the Berne Convention Implementation Act, amending the 1976 Copyright Act to conform to most of the provisions of the Berne Convention. As a result, the use of copyright notices has become optional to claim copyright, because the Berne Convention makes copyright automatic. However, the lack of notice of copyright using these marks may have consequences in terms of reduced damages in an infringement lawsuit – using notices of this form may reduce the likelihood of a defense of "innocent infringement" being successful. In most jurisdictions the copyright holder must bear the cost of enforcing copyright. This will usually involve engaging legal representation, administrative or court costs. In light of this, many copyright disputes are settled by a direct approach to the infringing party in order to settle the dispute out of court. "...by 1978, the scope was expanded to apply to any 'expression' that has been 'fixed' in any medium, this protection granted automatically whether the maker wants it or not, no registration required." For a work to be considered to infringe upon copyright, its use must have occurred in a nation that has domestic copyright laws or adheres to a bilateral treaty or established international convention such as the Berne Convention or WIPO Copyright Treaty. Improper use of materials outside of legislation is deemed "unauthorized edition", not copyright infringement. Statistics regarding the effects of copyright infringement are difficult to determine. Studies have attempted to determine whether there is a monetary loss for industries affected by copyright infringement by predicting what portion of pirated works would have been formally purchased if they had not been freely available. Other reports indicate that copyright infringement does not have an adverse effect on the entertainment industry, and can have a positive effect. In particular, a 2014 university study concluded that free music content, accessed on YouTube, does not necessarily hurt sales, instead has the potential to increase sales. to determine and decide how, and under what conditions, the work may be marketed, publicly displayed, reproduced, distributed etc. to transmit or display by radio, video or internet. The basic right when a work is protected by copyright is that the holder may determine and decide how and under what conditions the protected work may be used by others. This includes the right to decide to distribute the work for free. This part of copyright is often overseen. The phrase "exclusive right" means that only the copyright holder is free to exercise those rights, and others are prohibited from using the work without the holder's permission. Copyright is sometimes called a "negative right", as it serves to prohibit certain people (e.g., readers, viewers, or listeners, and primarily publishers and would be publishers) from doing something they would otherwise be able to do, rather than permitting people (e.g., authors) to do something they would otherwise be unable to do. In this way it is similar to the unregistered design right in English law and European law. The rights of the copyright holder also permit him/her to not use or exploit their copyright, for some or all of the term. There is, however, a critique which rejects this assertion as being based on a philosophical interpretation of copyright law that is not universally shared. There is also debate on whether copyright should be considered a property right or a moral right. Expansion of U.S. copyright law (currently based on the date of creation or publication). Copyright subsists for a variety of lengths in different jurisdictions. The length of the term can depend on several factors, including the type of work (e.g. musical composition, novel), whether the work has been published, and whether the work was created by an individual or a corporation. In most of the world, the default length of copyright is the life of the author plus either 50 or 70 years. In the United States, the term for most existing works is a fixed number of years after the date of creation or publication. Under most countries' laws (for example, the United States and the United Kingdom), copyrights expire at the end of the calendar year in question. The length and requirements for copyright duration are subject to change by legislation, and since the early 20th century there have been a number of adjustments made in various countries, which can make determining the duration of a given copyright somewhat difficult. For example, the United States used to require copyrights to be renewed after 28 years to stay in force, and formerly required a copyright notice upon first publication to gain coverage. In Italy and France, there were post-wartime extensions that could increase the term by approximately 6 years in Italy and up to about 14 in France. Many countries have extended the length of their copyright terms (sometimes retroactively). International treaties establish minimum terms for copyrights, but individual countries may enforce longer terms than those. In the United States, all books and other works published before 1923 have expired copyrights and are in the public domain. In addition, works published before 1964 that did not have their copyrights renewed 28 years after first publication year also are in the public domain. Hirtle points out that the great majority of these works (including 93% of the books) were not renewed after 28 years and are in the public domain. Books originally published outside the US by non-Americans are exempt from this renewal requirement, if they are still under copyright in their home country. But if the intended exploitation of the work includes publication (or distribution of derivative work, such as a film based on a book protected by copyright) outside the U.S., the terms of copyright around the world must be considered. If the author has been dead more than 70 years, the work is in the public domain in most, but not all, countries. In 1998, the length of a copyright in the United States was increased by 20 years under the Copyright Term Extension Act. This legislation was strongly promoted by corporations which had valuable copyrights which otherwise would have expired, and has been the subject of substantial criticism on this point. In many jurisdictions, copyright law makes exceptions to these restrictions when the work is copied for the purpose of commentary or other related uses. US copyright does NOT cover names, title, short phrases or Listings (such as ingredients, recipes, labels, or formulas). However, there are protections available for those areas copyright does not cover – such as trademarks and patents. The idea–expression divide differentiates between ideas and expression, and states that copyright protects only the original expression of ideas, and not the ideas themselves. This principle, first clarified in the 1879 case of Baker v. Selden, has since been codified by the Copyright Act of 1976 at 17 U.S.C. § 102(b). Copyright law does not restrict the owner of a copy from reselling legitimately obtained copies of copyrighted works, provided that those copies were originally produced by or with the permission of the copyright holder. It is therefore legal, for example, to resell a copyrighted book or CD. In the United States this is known as the first-sale doctrine, and was established by the courts to clarify the legality of reselling books in second-hand bookstores. Some countries may have parallel importation restrictions that allow the copyright holder to control the aftermarket. This may mean for example that a copy of a book that does not infringe copyright in the country where it was printed does infringe copyright in a country into which it is imported for retailing. The first-sale doctrine is known as exhaustion of rights in other countries and is a principle which also applies, though somewhat differently, to patent and trademark rights. It is important to note that the first-sale doctrine permits the transfer of the particular legitimate copy involved. It does not permit making or distributing additional copies. In Kirtsaeng v. John Wiley & Sons, Inc., in 2013, the United States Supreme Court held in a 6–3 decision that the first-sale doctrine applies to goods manufactured abroad with the copyright owner's permission and then imported into the US without such permission. The case involved a plaintiff who imported Asian editions of textbooks that had been manufactured abroad with the publisher-plaintiff's permission. The defendant, without permission from the publisher, imported the textbooks and resold on eBay. The Supreme Court's holding severely limits the ability of copyright holders to prevent such importation. In addition, copyright, in most cases, does not prohibit one from acts such as modifying, defacing, or destroying his or her own legitimately obtained copy of a copyrighted work, so long as duplication is not involved. However, in countries that implement moral rights, a copyright holder can in some cases successfully prevent the mutilation or destruction of a work that is publicly visible. In the United Kingdom and many other Commonwealth countries, a similar notion of fair dealing was established by the courts or through legislation. The concept is sometimes not well defined; however in Canada, private copying for personal use has been expressly permitted by statute since 1999. In Alberta (Education) v. Canadian Copyright Licensing Agency (Access Copyright), 2012 SCC 37, the Supreme Court of Canada concluded that limited copying for educational purposes could also be justified under the fair dealing exemption. In Australia, the fair dealing exceptions under the Copyright Act 1968 (Cth) are a limited set of circumstances under which copyrighted material can be legally copied or adapted without the copyright holder's consent. Fair dealing uses are research and study; review and critique; news reportage and the giving of professional advice (i.e. legal advice). Under current Australian law, although it is still a breach of copyright to copy, reproduce or adapt copyright material for personal or private use without permission from the copyright owner, owners of a legitimate copy are permitted to "format shift" that work from one medium to another for personal, private use, or to "time shift" a broadcast work for later, once and only once, viewing or listening. Other technical exemptions from infringement may also apply, such as the temporary reproduction of a work in machine readable form for a computer. In the United States the AHRA (Audio Home Recording Act Codified in Section 10, 1992) prohibits action against consumers making noncommercial recordings of music, in return for royalties on both media and devices plus mandatory copy-control mechanisms on recorders. No action may be brought under this title alleging infringement of copyright based on the manufacture, importation, or distribution of a digital audio recording device, a digital audio recording medium, an analog recording device, or an analog recording medium, or based on the noncommercial use by a consumer of such a device or medium for making digital musical recordings or analog musical recordings. Later acts amended US Copyright law so that for certain purposes making 10 copies or more is construed to be commercial, but there is no general rule permitting such copying. Indeed, making one complete copy of a work, or in many cases using a portion of it, for commercial purposes will not be considered fair use. The Digital Millennium Copyright Act prohibits the manufacture, importation, or distribution of devices whose intended use, or only significant commercial use, is to bypass an access or copy control put in place by a copyright owner. An appellate court has held that fair use is not a defense to engaging in such distribution. It is legal in several countries including the United Kingdom and the United States to produce alternative versions (for example, in large print or braille) of a copyrighted work to provide improved access to a work for blind and visually impaired persons without permission from the copyright holder. A copyright, or aspects of it (e.g. reproduction alone, all but moral rights), may be assigned or transferred from one party to another. For example, a musician who records an album will often sign an agreement with a record company in which the musician agrees to transfer all copyright in the recordings in exchange for royalties and other considerations. The creator (and original copyright holder) benefits, or expects to, from production and marketing capabilities far beyond those of the author. In the digital age of music, music may be copied and distributed at minimal cost through the Internet; however, the record industry attempts to provide promotion and marketing for the artist and his or her work so it can reach a much larger audience. A copyright holder need not transfer all rights completely, though many publishers will insist. Some of the rights may be transferred, or else the copyright holder may grant another party a non-exclusive license to copy or distribute the work in a particular region or for a specified period of time. A transfer or licence may have to meet particular formal requirements in order to be effective, for example under the Australian Copyright Act 1968 the copyright itself must be expressly transferred in writing. Under the U.S. Copyright Act, a transfer of ownership in copyright must be memorialized in a writing signed by the transferor. For that purpose, ownership in copyright includes exclusive licenses of rights. Thus exclusive licenses, to be effective, must be granted in a written instrument signed by the grantor. No special form of transfer or grant is required. A simple document that identifies the work involved and the rights being granted is sufficient. Non-exclusive grants (often called non-exclusive licenses) need not be in writing under U.S. law. They can be oral or even implied by the behavior of the parties. Transfers of copyright ownership, including exclusive licenses, may and should be recorded in the U.S. Copyright Office. (Information on recording transfers is available on the Office's web site.) While recording is not required to make the grant effective, it offers important benefits, much like those obtained by recording a deed in a real estate transaction. Copyright may also be licensed. Some jurisdictions may provide that certain classes of copyrighted works be made available under a prescribed statutory license (e.g. musical works in the United States used for radio broadcast or performance). This is also called a compulsory license, because under this scheme, anyone who wishes to copy a covered work does not need the permission of the copyright holder, but instead merely files the proper notice and pays a set fee established by statute (or by an agency decision under statutory guidance) for every copy made. Failure to follow the proper procedures would place the copier at risk of an infringement suit. Because of the difficulty of following every individual work, copyright collectives or collecting societies and performing rights organizations (such as ASCAP, BMI, and SESAC) have been formed to collect royalties for hundreds (thousands and more) works at once. Though this market solution bypasses the statutory license, the availability of the statutory fee still helps dictate the price per work collective rights organizations charge, driving it down to what avoidance of procedural hassle would justify. Copyright licenses known as open or free licenses seek to grant several rights to licensees, either for a fee or not. Free in this context is not as much of a reference to price as it is to freedom. What constitutes free licensing has been characterised in a number of similar definitions, including by order of longevity the Free Software Definition, the Debian Free Software Guidelines, the Open Source Definition and the Definition of Free Cultural Works. Further refinements to these definitions have resulted in categories such as copyleft and permissive. Common examples of free licences are the GNU General Public License, BSD licenses and some Creative Commons licenses. Founded in 2001 by James Boyle, Lawrence Lessig, and Hal Abelson, the Creative Commons (CC) is a non-profit organization which aims to facilitate the legal sharing of creative works. To this end, the organization provides a number of generic copyright license options to the public, gratis. These licenses allow copyright holders to define conditions under which others may use a work and to specify what types of use are acceptable. Some sources are critical of particular aspects of the copyright system. This is known as a debate over copynorms. Particularly to the background of uploading content to internet platforms and the digital exchange of original work, there is discussion about the copyright aspects of downloading and streaming, the copyright aspects of hyperlinking and framing. Concerns are often couched in the language of digital rights, digital freedom, database rights, open data or censorship. Discussions include Free Culture, a 2004 book by Lawrence Lessig. Lessig coined the term permission culture to describe a worst-case system. Good Copy Bad Copy (documentary) and RiP! : A Remix Manifesto, discuss copyright. Some suggest an alternative compensation system. In Europe consumers are acting up against the raising costs of music, film and books, a political party has been grown out of it, The Pirates. Some groups reject copyright altogether, taking an anti-copyright stance. The perceived inability to enforce copyright online leads some to advocate ignoring legal statutes when on the web. Copyright, like other intellectual property rights, is subject to a statutorily determined term. Once the term of a copyright has expired, the formerly copyrighted work enters the public domain and may be used or exploited by anyone without obtaining permission, and normally without payment. However, in paying public domain regimes the user may still have to pay royalties to the state or to an authors' association. Courts in common law countries, such as the United States and the United Kingdom, have rejected the doctrine of a common law copyright. Public domain works should not be confused with works that are publicly available. Works posted in the internet, for example, are publicly available, but are not generally in the public domain. Copying such works may therefore violate the author's copyright. ^ "Definition of copyright". Oxford Dictionaries. Retrieved 20 December 2018. ^ "Definition of Copyright". Merriam-Webster. Retrieved 20 December 2018. ^ "Understanding Copyright and Related Rights" (PDF). www.wipo.int. p. 4. Retrieved 2018-12-06. ^ Daniel A. Tysver. "Works Unprotected by Copyright Law". Bitlaw. ^ Lee A. Hollaar. "Legal Protection of Digital Information". p. Chapter 1: An Overview of Copyright, Section II.E. Ideas Versus Expression. ^ "Journal Conventions – Vanderbilt Journal of Entertainment & Technology Law". www.jetlaw.org. ^ Blackshaw, Ian S. (20 October 2011). Sports Marketing Agreements: Legal, Fiscal and Practical Aspects. Springer Science & Business Media – via Google Books. ^ Kaufman, Roy (16 July 2008). Publishing Forms and Contracts. Oxford University Press – via Google Books. ^ "Copyright Basics" (PDF). www.copyright.gov. U.S. Copyright Office. Retrieved 20 February 2019. ^ "International Copyright Law Survey". Mincov Law Corporation. ^ Spahr, Wolfgang (2018-08-30). "BMG Reports Revenue Bump During First Half of 2018". Billboard. Retrieved 2018-09-03. ^ "Those Pesky "Terms of Service" Agreements you never read". Time Inc. Retrieved 24 June 2018. Facebook – yet to be graded by the new site – has grown notorious over the years for fiddling with its terms of service and privacy policies. In 2009 the Internet erupted when a change to the terms implied that Facebook owned all the content users uploaded forever, even if they closed their accounts. Facebook quickly changed their policy and enacted a new system where users could vote on changes to terms of service policies. ^ Bettig, Ronald V. (1996). Copyrighting Culture: The Political Economy of Intellectual Property. Westview Press. p. 9–17. ISBN 0-8133-1385-6. ^ Ronan, Deazley (2006). Rethinking copyright: history, theory, language. Edward Elgar Publishing. p. 13. ISBN 978-1-84542-282-0. Archived from the original on 19 November 2011. ^ "Statute of Anne". Copyrighthistory.com. Retrieved 8 June 2012. ^ Frank Thadeusz (18 August 2010). "No Copyright Law: The Real Reason for Germany's Industrial Expansion?". Der Spiegel. Retrieved 11 April 2015. ^ a b "Berne Convention for the Protection of Literary and Artistic Works Article 5". World Intellectual Property Organization. Retrieved 18 November 2011. ^ Garfinkle, Ann M; Fries, Janet; Lopez, Daniel; Possessky, Laura (1997). "Art conservation and the legal obligation to preserve artistic intent". JAIC 36 (2): 165–179. ^ "International Copyright Relations of the United States", U.S. Copyright Office Circular No. 38a, August 2003. ^ 165 Parties to the Berne Convention for the Protection of Literary and Artistic Works Archived 6 March 2016 at the Wayback Machine as of May 2012. ^ MacQueen, Hector L; Charlotte Waelde; Graeme T Laurie (2007). Contemporary Intellectual Property: Law and Policy. Oxford University Press. p. 39. ISBN 978-0-19-926339-4. ^ a b "Copyright Ownership: Who Owns What? – Copyright Overview by Rich Stim – Stanford Copyright and Fair Use Center". fairuse.stanford.edu. Retrieved 9 May 2017. ^ a b Peter K, Yu (2007). Intellectual Property and Information Wealth: Copyright and related rights. Greenwood Publishing Group. p. 346. ISBN 978-0-275-98883-8. ^ World Intellectual Property Organization. "Understanding Copyright and Related Rights" (PDF). WIPO. p. 8. Retrieved 1 December 2017. ^ a b Simon, Stokes (2001). Art and copyright. Hart Publishing. pp. 48–49. ISBN 978-1-84113-225-9. ^ "Subject Matter and Scope of Copyright" (PDF). copyright.gov. Retrieved 4 June 2015. ^ "Copyright in General (FAQ)". U.S Copyright Office. Retrieved 11 August 2016. ^ a b See Harvard Law School, Module 3: The Scope of Copyright Law. See also Tyler T. Ochoa, Copyright, Derivative Works and Fixation: Is Galoob a Mirage, or Does the Form(GEN) of the Alleged Derivative Work Matter?, 20 Santa Clara High Tech. L.J. 991, 999–1002 (2003) ("Thus, both the text of the Act and its legislative history demonstrate that Congress intended that a derivative work does not need to be fixed in order to infringe."). The legislative history of the 1976 Copyright Act says this difference was intended to address transitory works such as ballets, pantomimes, improvised performances, dumb shows, mime performances, and dancing. ^ The Berne Convention Implementation Act of 1988 (BCIA), Pub.L. 100–568, 102 Stat. 2853, 2857. One of the changes introduced by the BCIA was to section 401, which governs copyright notices on published copies, specifying that notices "may be placed on" such copies; prior to the BCIA, the statute read that notices "shall be placed on all" such copies. An analogous change was made in section 402, dealing with copyright notices on phonorecords. ^ Taylor, Astra (2014). The People's Platform:Taking Back Power and Culture in the Digital Age. New York City, New York, USA: Picador. pp. 144–145. ISBN 978-1-250-06259-8. ^ "U.S. Copyright Office – Information Circular" (PDF). Retrieved 7 July 2012. ^ Taylor, Astra (2014). The People's Platform: Taking Back Power and Culture in the Digital Age. New York, New York: Picador. p. 148. ISBN 978-1-250-06259-8. ^ Owen, L. (2001). "Piracy". Learned Publishing. 14: 67–70. doi:10.1087/09531510125100313. ^ "Urheberrechtsverletzungen im Internet: Der bestehende rechtliche Rahmen genügt". Ejpd.admin.ch. ^ Tom G. Palmer, "Are Patents and Copyrights Morally Justified?" Accessed 5 February 2013. ^ Nimmer, David (2003). Copyright: Sacred Text, Technology, and the DMCA. Kluwer Law International. p. 63. ISBN 978-90-411-8876-2. OCLC 50606064. ^ "Copyright Term and the Public Domain in the United States. ", Cornell University. ^ "John Wiley & Sons Inc. v. Kirtsaeng" (PDF). Archived from the original (PDF) on 2 July 2017. ^ "US CODE: Title 17,107. Limitations on exclusive rights: Fair use". .law.cornell.edu. 20 May 2009. Retrieved 16 June 2009. ^ "Chapter 1 – Circular 92 – U.S. Copyright Office". www.copyright.gov. ^ "Copyright (Visually Impaired Persons) Act 2002 comes into force". Royal National Institute of Blind People. 1 January 2011. Retrieved 11 August 2016. ^ a b WIPO Guide on the Licensing of Copyright and Related Rights. World Intellectual Property Organization. 2004. p. 15. ISBN 978-92-805-1271-7. ^ WIPO Guide on the Licensing of Copyright and Related Rights. World Intellectual Property Organization. 2004. p. 8. ISBN 978-92-805-1271-7. ^ WIPO Guide on the Licensing of Copyright and Related Rights. World Intellectual Property Organization. 2004. p. 16. ISBN 978-92-805-1271-7. ^ a b "Creative Commons Website". creativecommons.org. Retrieved 24 October 2011. ^ "MEPs ignore expert advice and vote for mass internet censorship". European Digital Rights. Retrieved 24 June 2018. Dowd, Raymond J. (2006). Copyright Litigation Handbook (1st ed.). Thomson West. ISBN 0-314-96279-4. Ellis, Sara R. Copyrighting Couture: An Examination of Fashion Design Protection and Why the DPPA and IDPPPA are a Step Towards the Solution to Counterfeit Chic, 78 Tenn. L. Rev. 163 (2010), available at http://ssrn.com/abstract=1735745. Ghosemajumder, Shuman. Advanced Peer-Based Technology Business Models. MIT Sloan School of Management, 2002. Lindsey, Marc: Copyright Law on Campus. Washington State University Press, 2003. ISBN 978-0-87422-264-7. Nimmer, Melville; David Nimmer (1997). Nimmer on Copyright. Matthew Bender. ISBN 0-8205-1465-9. Patterson, Lyman Ray (1968). Copyright in Historical Perspective. Online Version. Vanderbilt University Press. ISBN 0-8265-1373-5. Rife, by Martine Courant. Convention, Copyright, and Digital Writing (Southern Illinois University Press; 2013) 222 pages; Examines legal, pedagogical, and other aspects of online authorship. Rosen, Ronald (2008). Music and Copyright. Oxford Oxfordshire: Oxford University Press. ISBN 0-19-533836-7. Shipley, David E. Thin But Not Anorexic: Copyright Protection for Compilations and Other Fact Works UGA Legal Studies Research Paper No. 08-001; Journal of Intellectual Property Law, Vol. 15, No. 1, 2007. Silverthorne, Sean. Music Downloads: Pirates- or Customers?. Harvard Business School Working Knowledge, 2004. Sorce Keller, Marcello. "Originality, Authenticity and Copyright", Sonus, VII(2007), no. 2, pp. 77–85. Steinberg, S.H. ; Trevitt, John (1996). Five Hundred Years of Printing (4th ed.). London and New Castle: The British Library and Oak Knoll Press. ISBN 1-884718-19-1. Story, Alan; Darch, Colin; Halbert, Deborah, eds. (2006). The Copy/South Dossier: Issues in the Economics, Politics and Ideology of Copyright in the Global South (PDF). Copy/South Research Group. ISBN 978-0-9553140-1-8. Archived from the original (PDF) on 16 August 2013. Wikisource has the text of the 1911 Encyclopædia Britannica article Copyright. This page was last edited on 13 April 2019, at 22:21 (UTC).